There's nothing sweeter than a vacation in the Smoky Mountains when you're staying at SUGAR BEAR! This outstanding, custom designed & decorated home offers guests the best in modern mountain living. Access the cabin without any steep mountain roads, then enter from level parking across the covered porch and into the vaulted, open concept living area. A huge kitchen with granite breakfast bar opens to dining for 6, and the vaulted living room beyond. A stone gas fireplace adorned with an LED tv is perfect for snuggling up to your favorite movie, or for tuning in the big game! 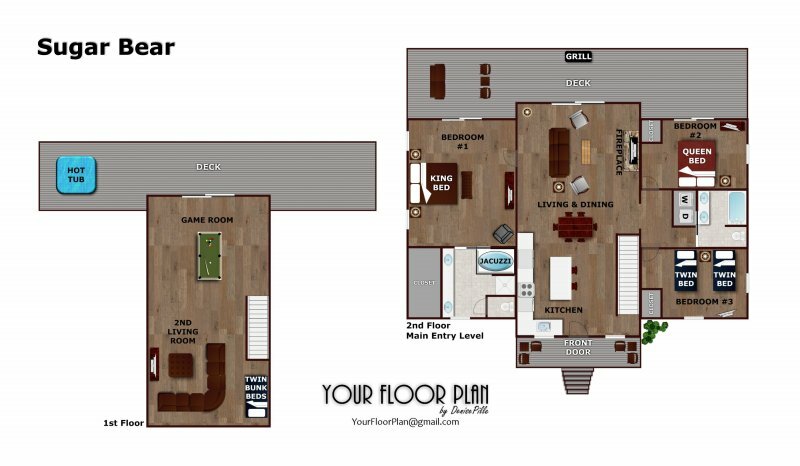 Three bedrooms offer comfortable spaces for up to 8 guests to spread out and enjoy the cabin on two levels of living. A second living area downstairs includes a sectional sofa and huge LED TV. Compete at the pool table for the cabin title, or retire to the hot tub with a good book for a little quiet time. There's no doubt that SUGAR BEAR is one sweet cabin! Call today to reserve your stay.